A team of Queen's students – Xavier McMaster-Hubner (Computer Science), Sam Alton (ECEi), Erik Koning (ECE), Raed Fayad (ECEi), and Nathaniel Pauzé (ECE) – recently earned a top prize at the Mayor’s Innovation Challenge in Kingston. Weak or unreliable wireless data connectivity is an ongoing frustration for consumers and businesses in Eastern Ontario. Imagine yourself committing to a multi-year wireless service contract only to discover that coverage is unreliable at home or at work, the areas where you spend most of your time. Regulators also need to know for sure where service gaps most need to be filled so they can prioritize new locations for cell tower permits. A team of Queen’s students has come up with a novel way for consumers and regulators to more easily understand where there are gaps in wireless connectivity. Raed Fayad (Electrical and Computer Engineering – Innovation Stream), Sam Alton (Electrical and Computer Engineering – Innovation Stream), Nathaniel Pauzé (Electrical and Computer Engineering), and Xavier McMaster-Hubner (Computer Science) developed a proof-of-concept system to measure varying cellular data signal strength across Kingston and to display those data on a visual heat map. Users would be able to view the heat map online to see how reliable their cellular signal would be depending on where they are in the city. The group came together as team K-Connect at the QHacks hackathon at Queen’s in early February. The idea earned the team one of two spots in the City of Kingston Mayor’s Innovation Challenge pitch competition a week later. They presented to a panel of municipal and academic leaders at Kingston City Hall, earning a top prize in that competition. (The other winner was Blackrose Technology led by Erik Koning (Electrical and Computer Engineering), who proposed using drones to monitor environmental threats or to help in search-and-rescue). Each team earned $4,000 in seed funding for their ventures and admission to the 2019 QICSI start-up accelerator program. This article was first published on the website of the Faculty of Engineering and Applied Science. Michael Doxtater, Queen's National Scholar in Indigenous Studies: Land- and Language-Based Pedagogies and Practices offers a traditional Mohawk welcoming. The Four Directions Women Singers perform at the Mitchell Hall opening ceremony. 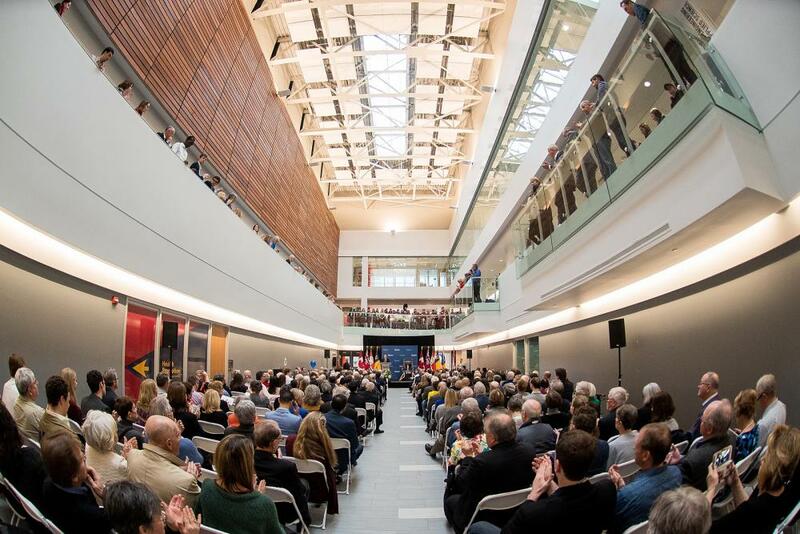 Roaring applause and celebratory streamers filled the grand central atrium at Mitchell Hall this past weekend, marking the official opening of Queen’s University’s newest building. 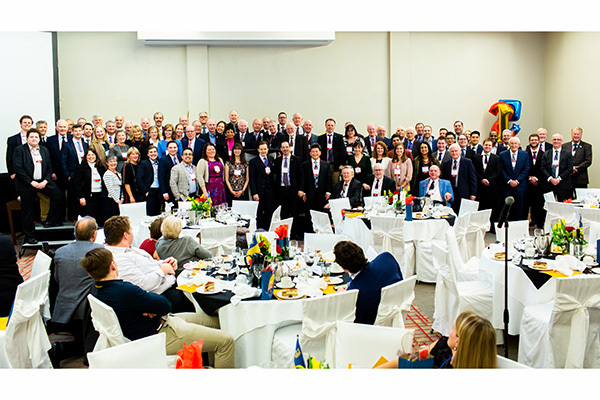 With a little help from a robot named Ibex, Principal and Vice-Chancellor Daniel Woolf and lead donor Bruce Mitchell made the announcement to an audience of several hundred guests – including donors, government officials, and members of the campus community. The Government of Ontario and the Government of Canada’s Post-Secondary Institutions Strategic Investment Fund also provided a combined $21.8 million to support the project. Kingston and the Islands Member of Parliament, Mark Gerretsen, and Ontario’s Minister of Municipal Affairs and Housing, Steve Clark, shared remarks during the ceremony. Earlier in the week, Canada’s Minister of Innovation, Science, and Economic Development, Navdeep Bains, joined Principal Woolf and members of Queen’s University’s senior administration on a tour of the facility. The Chair of the Queen's Board of Trustees, Don Raymond, as well as Chancellor Jim Leech, Dean of Engineering and Applied Science Kevin Deluzio; and Rector Alexandra da Silva also spoke at the ribbon-cutting ceremony on Saturday, March 30. Guests then toured Mitchell Hall for a glimpse at many of the spaces and services that have been welcoming students over the past few months during the phased launch of the building, as well as spaces debuting over the next few months. The building, located on the former site of the Physical Education Centre (PEC) at the corner of Union and Division streets in Kingston, hosts a wide variety of centres and services, as well as lounge, study, and co-working spaces. The Queen’s community is encouraged to visit Mitchell Hall, and explore everything it has to offer. Innovation, Science and Economic Development Minister Navdeep Bains and Kingston and the Islands MP Mark Gerretsen speaks with two members of Spectra Plasmonics. Kingston and the Islands MP Mark Gerretsen, Innovation, Science and Economic Development Minister Navdeep Bains, and Principal Daniel Woolf listen to Pascale Champagne, Director of the Beaty Water Research Centre. 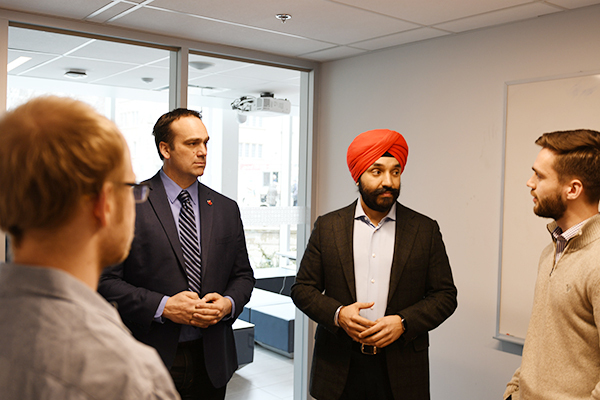 Vice-Principal (Research) Kimberly Woodhouse and Dean of the Faculty of Engineering and Applied Science Kevin Deluzio speak with Innovation, Science and Economic Development Minister Navdeep Bains during his tour of Mitchell Hall. Innovation, Science and Economic Development Minister Navdeep Bains stops for a photo with a pair of Queen's students during his tour of Mitchell Hall. From left: Vice-Principal (University Relations) Michael Fraser; Vice-Provost and Dean of Student Affairs Ann Tierney; Kingston and the Islands MP Mark Gerretsen; Principal and Vice-Chancellor Daniel Woolf; Innovation, Science and Economic Development Minister Navdeep Bains; Dean of the Faculty of Engineering and Applied Science Kevin Deluzio; and Vice-Principal (Research) Kimberly Woodhouse. Principal Daniel Woolf welcomed Innovation, Science and Economic Development Minister Navdeep Bains and Kingston and the Islands MP Mark Gerretsen for a tour of the newly-renovated Mitchell Hall, on Thursday March 28. Joined by Ann Tierney, Vice-Provost and Dean of Student Affairs, Kim Woodhouse, Vice-Principal (Research), Michael Fraser, Vice-Principal (University Relations), and Kevin Deluzio Dean, Faculty of Engineering and Applied Science, the tour included stops at the Dunin-Deshpande Queen’s Innovation Centre, the Côté Sharp Student Wellness Centre, and the facility’s Technology-Enabled Active Learning Spaces. Minister Bains also visited the Beaty Water Research Centre, touring the lab spaces alongside director Pascale Champagne and some of her students. The tour wrapped up with a brief visit to the future home of Ingenuity Labs. The construction of Mitchell Hall was supported in part by an investment from the Government of Canada under the Post-Secondary Institutions Strategic Investment Fund (PSI-SIF). Queen’s will host the grand opening of Mitchell Hall on Saturday, March 30. Water-related issues are increasingly becoming a driving force for economic growth, social well-being, and a healthy population in Canada and around the world. This critical interest is reflected in the diversity of water-related research and education initiatives at the Beaty Water Research Centre (BWRC), which recently moved into its state-of-the-art research facilities in Mitchell Hall, the result of a generous gift from geologist and entrepreneur Ross J. Beaty. The BWRC encourages collaborative interdisciplinary research, education and outreach, spanning traditional water-related disciplines, as well as non-traditional and emerging disciplines. Recent highlights include new research funding and the launch of the BWRC’s first on-line interdisciplinary graduate program in Water and Human Health (WHH GDip). BWRC Director Pascale Champagne (Civil Engineering) and her master’s student Nicole Woodcock recently received research funding from the National Science and Engineering Research Council (NSERC) Engage program ($20,000), and the Ontario Centre of Excellence Voucher for Innovation and Productivity I (VIP I) program ($25,000), to assess the feasibility of using microbially-induced calcite precipitation (MICP) to improve the deposit performance of tailings. Tailings are by-products from mining operations. Mine tailing particulates easily diffuse into the surrounding environment, leaching acidic drainage and heavy metals to surface and groundwater. Without treatment these tailings can take several hundred years to consolidate due to their poor water-releasing properties, and, in some cases failure to consolidate has led to catastrophic disasters. BGC Engineering Inc. is a private, employee-owned Canadian company with expertise in mine waste engineering and mine closure planning and design. With support from the Faculty of Engineering and Applied Sciences, the BWRC is launching a new online, interdisciplinary graduate diploma program in Water and Human Health (WHH GDip), in May 2019. The WHH GDip program can be completed on a full-time basis in four months through four online courses. Upon successful completion participants will receive a graduate diploma from Queen’s, giving them a competitive edge in their future careers. The diploma, although a standalone offering, can also be applied to course-work required for a course-based or research master’s program offered in a number of departments and faculties at Queen’s. Find out more about the Beaty Water Research Centre. With only days until its grand opening ceremony, Queen’s University’s new hub of innovation and student wellness is already bustling with activity. Over the last few months, spaces inside Mitchell Hall have been welcoming students, faculty, and staff, and have quickly become central to daily campus life. Home to expanded engineering and research facilities, collaborative and experiential learning spaces, and a wide spectrum of student services, Mitchell Hall was designed to build community and foster the important relationships that connect mental health, physical well-being, academic, and personal success. On Saturday, March 30, members of the Queen's and Kingston communities will gather in Mitchell Hall’s grand, sunlit central atrium, alongside donors and government officials for the facility’s official ribbon-cutting event at 11 am. Representatives of the university and the students, provincial and local governments will make remarks at the ceremony, as will Bruce Mitchell (Sc’68) – the lead patron who will speak on behalf of all donors to the project. The building, located on the former site of the Physical Education Centre at the corner of Union and Division streets, was made possible by $50 million in philanthropic support and a combined $21.8 million from the Government of Canada’s Post-Secondary Institutions Strategic Investment Fund and from the Government of Ontario. Behind its original limestone façade, Mitchell Hall’s new facilities house a wide variety of centres and services in bright, contemporary spaces – many of which took up occupancy and opened for use during a phased launch that began in November 2018. Among the first student services to invite guests in were the Gregory David and Neil Rossy Health Promotion Hub, Faith and Spiritual Life, and Student Community Relations, all of which opened in December 2018. Three gymnasiums also opened, as did new examination facilities, which hosted the writing of nearly 65,000 fall term exams. Doors also opened to Faculty of Engineering and Applied Science technology-enabled active learning classrooms. December also brought the opening of the Queen’s University International Centre, which moved to Mitchell Hall after 50 years of operation in the John Deutsch University Centre. Queen’s is currently home to approximately 3,500 international students who, together with the entire campus community, can now make use of the space to meet, work, relax, and seek out academic opportunities and support. The Rose Innovation Hub made its January debut at the Dunin-Deshpande Queen’s Innovation Centre’s (DDQIC) “Ignition Week” – a five-day exploration of all things entrepreneurship and innovation for students. Showcased during the celebration were the DDQIC’s offices, a large, modern event commons, a suite of co-working spaces for early-stage innovators, the LinQLab workshop space with modern multimedia capabilities, and the SparQ Studios makerspace – equipped with 3D scanners, 3D printers, laser cutting, wood and metal working, and more. The High Performance Varsity Training Centre and new athletic space also opened for student-athletes in January 2019. Following the grand opening ceremony, guests will tour these spaces, as well as the newly debuted Beaty Water Research Centre, and spaces opening later this year, including the Côté Sharp Student Wellness Centre and Ingenuity Labs – a new institute focused on the design and use of intelligent systems and robotic machines to enhance human productivity, creativity, safety, and quality of life. A livestream will be available online and on Facebook Live starting at 10:55 am EST on March 30, 2019. Ryan P. Mulligan, is an associate professor in Civil Engineering at Queen's. Queen’s University researchers have secured more than $1 million in research infrastructure funding from the Canada Foundation for Innovation (CFI) John R. Evans Leaders Fund. “Through this support, researchers will be able to build the foundational research infrastructure required to conduct cutting-edge research, and contribute to important new developments in their fields,” says Kimberly Woodhouse, Vice-Principal (Research). A total of nine Queen’s researchers will receive the federal funding in a variety of fields, from the ongoing search for dark matter to investigating stem cells, to probing the transition from suicide ideation to attempts to establishing a mobile-inclusive music theatre makerspace. Sheela Abraham (Biomedical and Molecular Sciences) has received $162,500 to further the study of cancer stem cells in relation to chronic myeloid leukaemia using systems biology. With the funding, she plans to investigate cell signaling events outside cells controlled by extracellular vesicles and look into if these extracellular vesicles may be key controllers in the aging of stem cells and how this could lead to cancer. Dr. Abraham will also investigate the possibility of using extracellular vesicles as biomarkers for chronic myeloid leukaemia, which would help doctors detect the disease more efficiently, and improve patient treatment and survival. Joseph Bramante (Physics, Engineering Physics, and Astronomy) has received $49,970 to better determine dark matter’s origin, character, and connection to known physics. Novel new physics search techniques are being developed alongside identified techniques, including using thermal emission of neutron stars as a signature of dark matter, searches for multiply interacting massive particles at underground laboratories, the abundance of elements like gold in dwarf galaxy as a tracer of so-called “asymmetric” dark matter, and charting dark matter’s interaction with neutrinos. Julia Brook and Colleen Renihan (Dan School of Drama and Music) has received $40,800 to create a music theatre makerspace in order to examine the development and implementation of music theatre activities with underserved populations, such as students in rural and on-reserve communities as well as seniors and adults with cognitive exceptionalities. Participants will work with facilitators to develop music theatre activities using acoustic and digital music tools as well as custom made sets and costumes from the makerspace. Kenneth Clark (Physics, Engineering Physics, and Astronomy) has received $189,951 to develop a scintillating bubble chamber to support the ongoing search for dark matter. Direct detection involves the interaction of dark matter in a purpose-built detector such as that used by the PICO collaboration. This group has produced world-leading results for a spin-dependent interaction of dark matter with the backgrounds being the largest issue. The scintillating bubble chamber would identify these backgrounds, leveraging the current efforts for a significant improvement in the dark-matter hunt. Vahid Fallah (Mechanical and Materials Engineering) has received $125,000 to support research into improving the process of selective laser melting, also called metal 3D printing. In this research program, the selective laser melting processing of reactive/sensitive metals will be optimized for more stability and a less reactive build environment. The former will be achieved by optimizing the laser optics assembly, and the latter will be realized by strictly controlling the build atmosphere through an innovative build enclosure design. Madhuri Koti (Biomedical and Molecular Sciences) has received $150,000 to support her research program’s goals of identify tumour-specific genetic features that specifically associate with the anti-tumour immune responses and whether these could aid in decision making for combination immunodulatory treatment; design optimal combination of chemotherapy and immunotherapy approaches for use with immune stimulating drugs; and develop markers of chemotherapy-specific host immune alterations for future design of biomarker guided clinical trials to improve patient outcomes. Bhavin Shastri (Physics, Engineering Physics, and Astronomy) has received $132,500 to establish a facility with an experimental test and measurement platform and an optical probe station to demonstrate photonic integrated circuits for neuromorphic computing. Photonic neuromorphic processors have the potential to outperform microelectronics in energy efficiency and computational speeds by seven- and four-orders of magnitude, respectively. Jeremy Stewart (Psychology) has received $100,000 to support research into identifying factors that predict the transition from suicide ideation to attempts. This transition is a pivotal target for suicide prevention, but little is known about which youth will make this shift and what processes are involved. The research will employ electrophysiology, laboratory-based behavioural observation, and real-time, daily Smartphone-based assessments to gain novel insights into the processes involved. Aaron Vincent (Physics, Engineering Physics, and Astronomy) has received $50,000 for his research into developing novel ways to search for and detect dark matter, using its effect on stars such as the sun, and how to use neutrinos as probes of new physics beyond the Standard Model. This research relies on computer simulations of particle physics and astronomical systems such as stars, clusters, and the cosmos, as well as statistical methods aimed at exploring the many possible models of new physics to compare them with data from dozens of different experiments conducted in underground laboratories, ground-based observatories, and in space. For more information on the supported projects, or to learn more about the John R. Evans Leaders fund, visit innovation.ca. Find out more about research at Queen’s. Don’t miss out on research funding opportunities, subscribe to the University Research Services Funding Opportunities listserv.